Here we have the Royal Muscled Cuirass, Lorica Segmentata, Horseman Muscle Amour, Roman Soldier Belt, Roman Greaves, Greek Greaves, and Alexander the Great Linen Cuirass. Ancient Historical Brass Armour Display. Early armor of Rome and Greece were influenced heavily by each other and it would not be unusual to see early Roman armies wearing armour and helmets similar to those worn by the soldiers of Greece and Gaul. Our Armor Display Stand for breastplate and helmet will exhibit your armor like the museums on this practical wood display stand which is the perfect height to display a half suit of armor consisting of a breastplate and helmet. This gladiator collar is made from 18 gauge brass; its two halves are fitted around the neck by securing it into position with a pair of removable brass hinge pins. Our Blonde Plume Roman Centurion Armour, circa: 110 B.C. A select number of distinguished Roman officers known as "Centurions" were so-named because they originally were in control of large legions of roughly 100 men. Our Charioteer Armour Display, a charioteer of Julius Caesar's time would have worn armour like this! Set includes cuirass (breastplate & backplate), Helmet with plume and wooden armor stand. The Greek Horseman Muscle Armour is unusual with its widened form. Designed to replace a standard breastplate that would obstruct a soldier riding a horse. Our Gladiator Leather Arm Guard Segmentata is made from quality leather segments. Includes straps and buckles. Our Gladiator Retarius Arena Net is an authentic reproduction of the Roman Retaruis. This net would make a great addition to your Gladiator display. Our Charioteer Helm is the epic helm portrayed in the great chariot races of film and history! Beautifully hand-crafted in brass. Stud accented with real hair tail plume as the originals. Stunning! Our Corinthian Soldier Armour Set is an historical Brass Armour Display. The Roman Greaves were designed to protect the lower leg from the cut of a sword or the vicious kicking that occurred during battle. Although worn by many Roman Units, greaves were not worn by all. Our replica steel greaves are based on patterns depicted on Trajan's Columns as well as other sources of that period. The Lorica Segmentata is believed to have been introduced in the ranks of the Roman Army during the first century A.D. and widely used at the height of the Roman Empire. Although it never completely replaced the mail (Lorica Hamata) and scale armour (Lorica Squamata). Our Plain Brass Greaves, Lower Leg Armour, are a simple form of leg protection. These plain greaves are suitable for many historic periods from Roman to Renaissance. Made from brass, with leather straps. Sold as a pair. Our Plain Iron Greaves, Lower Leg Armour, are a simple form of leg protection. These plain greaves are suitable for many historic periods from Roman to Renaissance. Made from iron, they include leather straps. Sold as a pair. Our Roman Gladiator Chest and Back Armor is made from two plates of 20 gauge brass and are hinged together with pins. Includes front and back brass armor plates. Our Roman Gladiator Trident includes a hardwood handle and steel prongs. Our Imperial Roman Centurion Armour, from when Rome ruled one of the greatest empires the world has ever seen, an empire of unified government, communication, and a strong army of superbly well-drilled fighters whose discipline and weapons proved superior to most others. Our Imperial Rome Centurion Guard Helmet were the Main officers of the Imperial Roman guard also known as the Centurions, each in charge of 100 men, hence the name "century". Our Red Plume Roman Centurion Armour, circa: 110 B.C. A select number of distinguished Roman officers known as "Centurions" were so-named because they originally were in control of large legions of roughly 100 men. Our Roman Guards Helm worn by the Guards based in Rome that stood as the main body of troops in the defense of the Roman Empire, unlike the legionaries who were stationed primarily on the frontier, marching throughout Europe. Our Roman Helmet Blonde Plume is a wonderful and historical full size helm handcrafted of 18 gauge steel and is as glorious as the originals with striking blond hair plume easily distinguishing the "Commander" in Battle! Wearable. Our Roman Imperial Gallic Legionnaires Helmet is a fine example of a mid-1st century Legionnaires Roman helmet boasts the same classic Gallic styling and hook/carrying handle as seen on the original now on exhibit in Worms, Germany. The Leather Royal Muscled Roman Cuirass is made of molded leather and decorated with snakes and lions, with alluminum fittings and brass rivets. Great look for any Roman reenctor or just a fan of the Roman Era. A wonderful piece for your needs. Our Lorica Squamata - Brass Scale Armor is made from 24 gauge solid brass scales that are each individually stitched onto the under fabric of thick cotton. This armor closes on the sides with two straps and buckles. These Roman Marching Sandals Caliga have Ankle high leather with leather sole and lace closure. Sole includes hobnails. Brown only. Available in Men's whole sizes 8-13. The Lorica Segmentata was worn by the Roman Legions as they marched through history and built the glory that was Rome. Corbridge Type A. The Roman Lorica Segmentata Arm Attachment is segmented armour protection for the full arm. Straps and buckles are included. The Roman Lorica Segmenta was worn by the Roman Legions as they marched through history and built the glory that was Rome. Our lorica is a Stainless Steel reproduction. Corbridge Type A.
Roman Leather Muscle Armour, includes a breast and back plate in hardened leather. 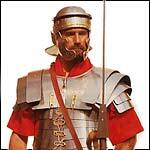 Worn by 5th century BCE Roman field army. Straps and buckles may vary. This Royal Muscled Cuirass has a blackened breast and back plate held together with metal pins. Fits up to a 46" chest. Samnite Triple Disc Cuirass in Brass c. 300 BCE, from a restored panoply in the Paestum Museum in Italy. Worn by Samnite warriors during the Samnite Wars with Rome. Our Roman Phalerae Harness in Brass is a set of nine phalerae in cast brass. Features central leonine phalera supported by two smaller leonine phalerae. 2 Medusa, 2 florate, and 2 concentric circle phalerae. The Roman Lorica from Get Dressed For Battle is Solidly constructed in 18 gauge steel, based on an original piece. This Lorica Segmentata will fit chest sizes up to 44". Fittings are cast in brass. Our Roman Imperial Italic Helm, circa 2nd Century AD During the time of the great battles with Germanic tribes, Imperial Roman soldiers began reinforcing their helms with added plates and crossbars. Roman Troopers Armour makes a great display piece. Includes a Roman Helmet and Wooden Armor Stand. Rome ruled one of the greatest empires the world has ever seen. Our Roman Troopers Helm from 100-299 A.D. This full size wearable helm is hand crafted in the style worn by the Legionary Roman infantry troops who marched across Europe from 100 to 299 A.D. The Royal Muscle Armor Set is an exquisitely crafted set of armour reviving the grandeur and attention to detail of noble ancient armours! Our Royal Muscle Armor / Cuirass is an eye catching Roman armour that is made of blackened steel with decorative brass lion and dragon ornaments. Our Roman Phalerae Harness in Aluminium is a set of nine phalerae in cast metal. Features central leonine phalera supported by two smaller leonine phalerae. 2 Medusa, 2 florate and 2 concentric circle phalerae. The Lorica Segmentata Armour heavy duty 18 ga. carbon steel. It will give you the perfect Roman Warrior look. Approximately 20 inches from the neck to bottom and will fit up to a 53 inch waist. Brass accents with leather straps. Our Scale Armor Cuirass is made from solid steel scales that are each individually riveted onto the under fabric of black leather. This armor is available in two sizes and closes on the sides with three straps and buckles. This Roman Lorica Segmentata Armor - Newstead type, is constructed from 18 gauge steel plates with brass fittings. The armor is blackened on the inside and articulated by riveting the plates to internal, thick leather bands. There are several stories about Chinese hunters using these giant forked tools to capture and kill big cats. It was also used as a weapon of war as a formidable fighting implement. Features an elongated central spike to maximize its thrusting potential and inwardly curved outer forks to increase the success of trapping.